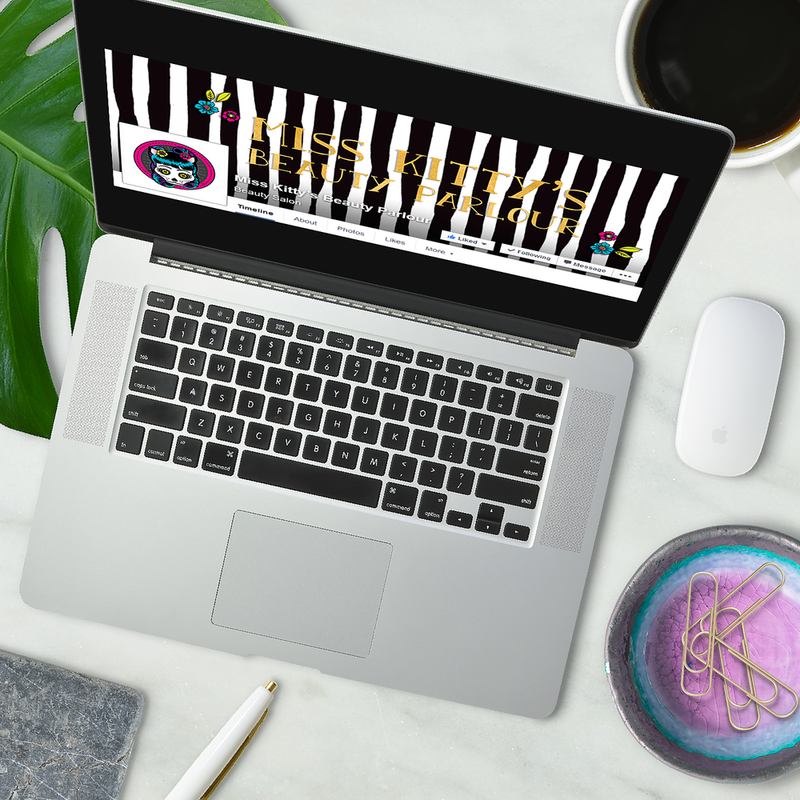 Finally launched today - the new and exciting brand for Miss Kitty's Beauty Parlour! Corinne's a busy mum and student and wanted to open her own home based beauty salon. What she didn't want, was for her home business to look unprofessional or boring, so she approached me about her ideas for a new brand that would add polish and cohesion to the marketing of her new business. From the first time I set eyes on Corinne's mood board, I knew this wasn't going to be any ordinary beauty brand. There wasn't a hint of relaxing scenes of polished, stacked rocks on bamboo mats (why do they even do that?). She was after something different that would stand out from the rest of the beauty crowd. As you can see, the Miss Kitty's mood board was an eclectic mix of bright happy colours, with a darker, rockabilly feel. It was also very important to Corinne that her trademark turquoise hair was somehow represented within her new branding. I wanted to delve into the brand a little more with Corinne so we had some back and forth about different aspects of her mood board, her business and her goals. Something Corinne said really stood out to me. She said, " I want to avoid the standard home beauty branding of pink/purple frangipanis and business cards from Vista Print." Now I'm not knocking Vista Print - they're a great low cost printing and marketing group and I've used them often myself. But if you're getting your branding from their pre-made templates and are hoping to be memorable in the eyes of your potential customers, you're probably going to be a little disappointed. I set out to create for Corinne a brand that had "an alternative/rock brand styling to step out of the haze of a market with an abundance of client options." (Her words again!) I originally explored options involving a Day of the Dead sugar skull cat theme. Lots of fun options but it just wasn't gelling for me with certain aspects of the Miss Kitty's moodboard and so we scrapped those ideas. In the end, we went with a rockabilly, tattoo style look with big "look at me" colours that were gonna POP! The final logo design! Let me tell you, it's surprisingly difficult to create a cat skull face that doesn't look either too cutesy or too mean! I think we found a nice balance though. The next step was creating alternative logos so Corinne can use them in different places and spaces. Despite the apparent circular shape of the Primary Logo, it's not quite circular and not symmetrical, which just makes it look awful if you try and constrict it in a circular shape like a Pinterest or Instagram profile. I created a horizontal logo, a more circular icon logo and a couple extra icons. And as always, Miss Kitty's logo will be able to be used on a light or a dark background. Any logo created by Garlic Friday Graphic Design will be able to be used on either dark or light backgrounds so you can maximise the versatility of your branding. Corinne wanted something graphic for Miss Kitty's Facebook page but also asked if I had "magical glitter powers". I told her I am indeed adept at such wizardry and we came up with a strong, bold design. We actually came up with a few as Corinne has plans to alternate things and mix it up, which is a very sound social media strategy. Next was the business card design. Corinne wanted something she could write appointments or notes on for customers. I recommended the black side be in gloss to make the colours of the logo seem as vibrant as possible. The business cards - pretty and functional! And last on the list of goodies for Miss Kitty's Beauty Parlour is a sweet treat for her clientele. Delicious sugary goodness, though my part is only the stickers. This is a great example of how the Primary logo didn't work in a small space or on a small scale, so we opted for one of the alternative logos. Folks, she's handing out candy!!! Hope you love this new design as much as I loved creating it! I wish Corinne all the best in her fun and fantastic new venture, and if you're in Toowoomba, why not look her up? You can reach Miss Kitty's Beauty Parlour at Facebook or Instagram. I'll leave you with the final Brand Style Board. What do you think of this new brand? I'd love to hear your comments!